This Muslim preacher is using his freedom of speech to make himself look ridiculous. Shouting in people’s faces and cursing at them does not get your point across in a good way. 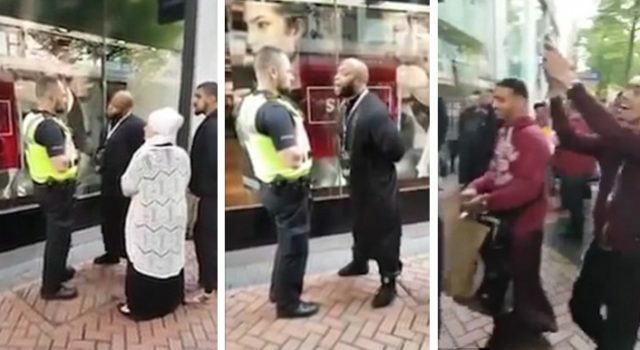 An Islamic street preacher has been arrested and charged after allegedly screaming abuse at a woman for wearing ‘tight jeans’ and shouting ‘Allah Akbar’ in a police officer’s face. Krissoni Henderson appeared to be caught on camera angrily confronting the officer – who was investigating a complaint made against the 31-year-old. The unnamed policeman was called to New Street in Birmingham city centre at around 5.30pm on July 4 following a 999 call from a 38-year-old woman who said she feared for her safety after a verbal confrontation. She alleged she had been shouted and sworn at. In the footage below, a man alleged to be Henderson is wearing traditional Islamic dress and standing with another man and a woman. He vehemently explains that the woman who complained had walked up to him rather than the other way round, making him the innocent party. ‘Do you think I’m scared?’ he says skeptically to the officer who is trying to reason with them. He goes on to claim that the woman who complained had threatened him when she approached him. But when the officer asks if he can give him the ‘common decency’ of not shouting over him the preacher continues to bellow his reasoning.